The weather may be great and the terrain may be charming, but lurking in the underbrush are plants that can make you wish you'd never left home. Poison ivy, poison oak and poison sumac are only the beginning. Some seemingly innocuous plants--such as goldenrod, yarrow, tansy and Bishop's weed--cause rashes in susceptible victims. Several plants that cause allergic reactions resemble perennials, and are sometimes even planted in landscapes. Yarrow, goldenrod, tansy, Bishop's weed and Queen Anne's lace all are small, flowering plants that grow 2 to 4 feet high. Poison oak and poison sumac grow as shrubs, although poison oak may grow as a vine in the western United States. Poison ivy grows as a vine in the East, Midwest and South in the United States, according to the American Academy of Dermatology, and grows as a shrub in western and northern United States and Canada. Queen Anne's lace, Bishop's weed and wild parsnip all produce feathery flowers that are typically white. Yarrow produces large heads made of many small flowers. Goldenrod blooms on tall, yellow spikes. Tansy's flowers are small and round, on individual stems. Poison ivy and poison oak produce greenish or yellow flowers in early spring, followed by poisonous berries in the fall. The berries may be green or white, with a waxy appearance. Most of the small flowering weeds produce feathery foliage on upright stems. Poison ivy and poison oak produce leaves with a cluster of three leaflets, prompting the old adage, "leaves of three, leave it be." Identifying poison ivy and poison oak becomes confusing, because the leaves may have slightly different shapes. Some are elongated, while others are rounder. Some may have toothed edges, while others have smooth edges. Poison ivy leaves are red when they emerge in spring, turn green during summer and turn red or yellow in the fall. Poison sumac produces a row of paired leaflets on each stem that may have black spots. Many of the small, flowering weeds grow throughout the United States. They thrive in dry conditions and poor soil and are found in fields and along roads. Poison oak grows throughout the Pacific Northwest and Canada. 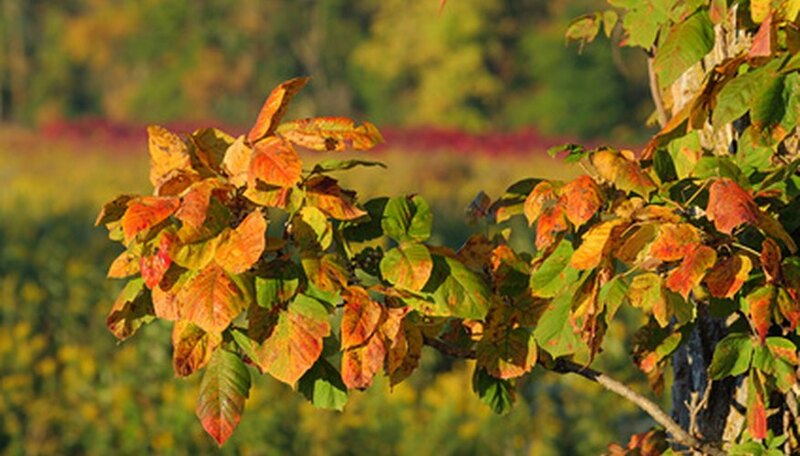 Poison sumac is found in standing water or bogs in the Northeast, Midwest and Southeast. Poison ivy grows throughout the United States in fields, woodlands and even in landscapes. Flowering plants--such as Bishop's weed, Queen Anne's lace, wild parsnip and goldenrod--can cause a reaction known as phytophotodermatitis. Reactions vary, but are caused by contact with the plant followed by exposure to the sun. Typically, a sensitive individual develops an eczema-like rash that heals within a few days. Oddly, though, the infected skin may darken and remain discolored for several months after contact. Contact with poison ivy, sumac or oak causes severe blistering and rashes, although reactions vary. The oils from these plants remain active on clothing, shoes or pets for up to five years, causing reactions long after the initial contact. What Perennials Have 5 Leaves?